The train to Lucca from Firenze seemed crowded, but then it was a holiday, Ognisanti or All Saints’ Day. Still, the costumed young people (and occasional adult with a modest devil’s horns headband), seemed a bit odd the day after Halloween, especially since Halloween is not a big deal here. 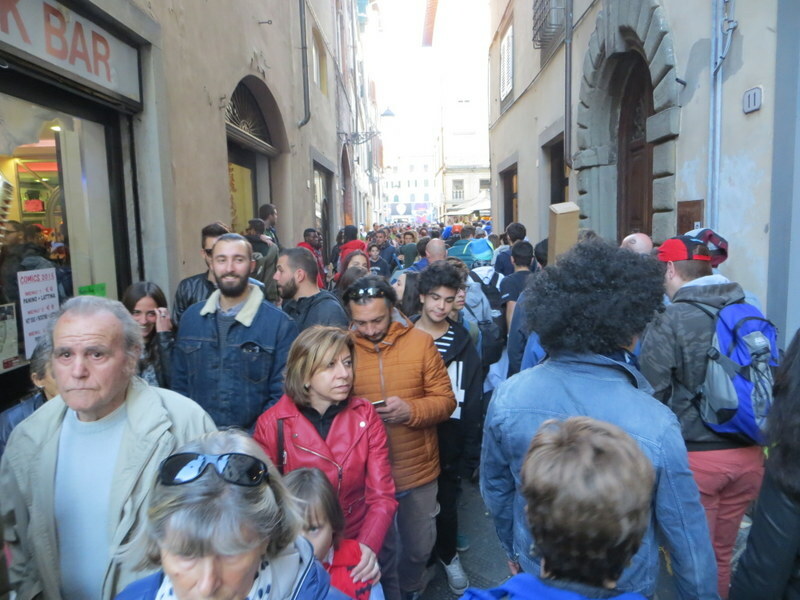 Walking toward the famous wall that surrounds Lucca, the crowds were clearly large. Perhaps due to the spring-like day we had on November 1, people were lounging in the wide grassy lawns and parading on top of the wall in throngs. I found myself worrying that Lucca was just a little too popular and we would not enjoy a stroll around the mighty wall as intended. The gang from the Big Bang Theory would be at home here. We struggled up the stairs inside the wall with the hoards of arrivals who were now clutching panini of porchetta or mortadella eating on-the-go. It was a conga-line of people, from bambini to nonni. What the heck was going on? What was going on was Day 4 (and final day, grazie a Dio!) of Comics and Games 2015. 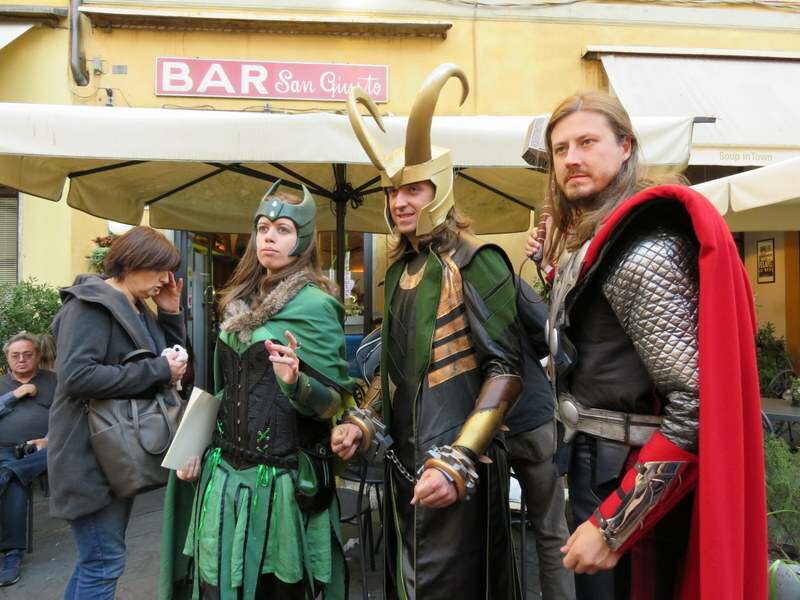 This is the Tuscan equivalent to Comic Con. As we wound our way through the narrow lanes searching for our B&B (XIII Century building!) we encountered more characters, some elaborately dressed, some less-so, but an ever-growing crowd of people searching for their favorite animators, authors, artists, game designers, movies, merchandise, and whatever they could get their hands on to eat or drink. Characters were happy to stop and pose for pictures. After checking in, we could not resist the impulse to venture into the streets and see this event. We were swept into the crowd, surging through the streets. It reminded me why I don’t go to crowded places unless I have a reserved seat. This was like a passaggiata that went out-of-control. We did bear up for about an hour-and-a-half, but the crowd was so dense that when we did see a place for coffee or lunch (15:30 and we still had not eaten) it was mobbed with super heroes, bananas, princesses, or invaders. It was fun to see the costumes, and the crowd, being overall nerdy and geeky, was very polite but it gets tiring to swim in a school, especially upstream. Luckily by 19:00 the event was over except for the cleanup, which would go on for days. We departed Wednesday and there were still event tents all over the city. We might have missed some of the charm of Lucca, but had anyone told us Comics & Games was on, we’d likely have changed our trip. Sometimes ignorance is bliss and you stumble into something interesting. A few more pictures for your enjoyment. Click on any picture for a slide show. Yes, there were some children, though far outnumbered by costumed adults. Star Wars featured prominently due to the new movie. The Bistrot served the usual Italian panini. Everyone in costume loved to pose. Even super heroes get lost. Every major street was clogged with foot traffic. Luckily, Lucca is almost car free. EMTs took to the streets on foot. No room for an ambulance here. Enormous crowd. We did not even dare go up on the wall. Robot handbag, anyone? Leather shop in Lucca. Poor puppy was forced to drag a (soccer) ball-and-chain. Even stores got in the spirit, here “Minions” in a woodworker’s shop. Harry Potter characters were prominent. 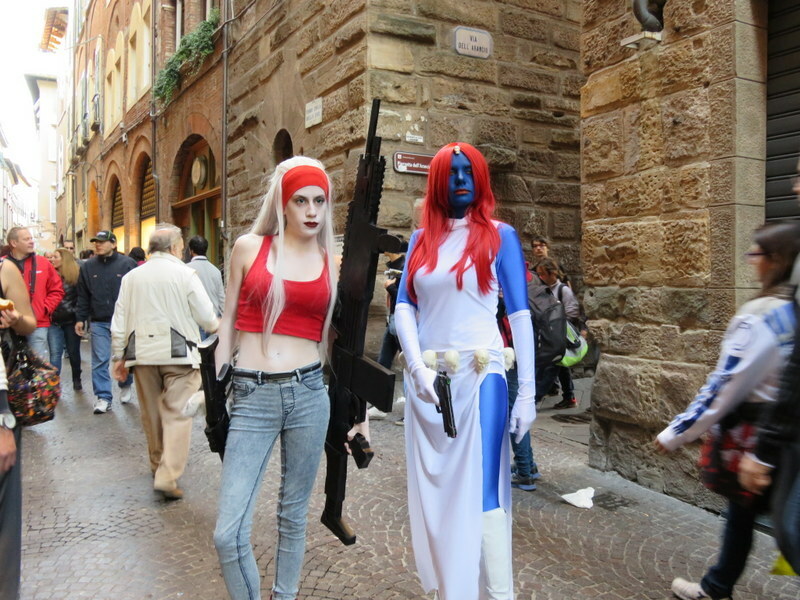 We were in Lucca two years ago just before Comic Con. We saw the tents set up and were told that Comic Con was coming. I can’t believe the crowds! HI Grier. Apparently every Italian knows about this event which I am told is “molto famoso.” Me? Ha! The tents are amazing and it looked like it would take a week to get them all down. I believe that Kim is either with you or will be soon! What a wonderful trip for her. And you are correct – The Big Bank Theory cast would have LOVED this Comic Con type event. Thanks Marcia! Kim is on-the-ground. Expecting her in less than two hours! But, wait, there’s more! That was only our Day 1, Day 4 for Comics & Games. We stayed 3 nights and did, indeed, get to walk the wall. I will post about it when I have time…. Stay tuned! While this is not your usual, I’m glad you went! Fun to see others celebrating “different” kind of stuff. Hope your Xlll B&B made up for missing walking on the wall. Oh good that there is more coming!